On the occasion of the official presentation that was held late in the afternoon at the Théâtre Marigny in Paris, Patrice Clerc, President of Amaury Sport Organisation and Étienne Lavigne, director of the Dakar, have unveiled the main lines of the course of the next edition in the presence of Carlos Enrique Meyer, Argentina’s State Secretary for Tourism and of Jaime Pizarro Herrera, State Secretary for Sports of Chile. 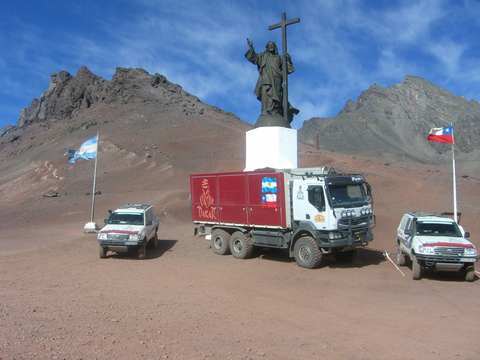 Returning from a series of reconnaissance taking place in both countries of South America that will be welcoming the Dakar for the first time, Étienne Lavigne gave out some information on the event that will take place from the 3rd to the 18th of January 2009. On the vast Argentinean and Chilean territories, a large loop of 9 000 kilometres including around 6 000 kilometres of specials, will have to be covered by the competitors to reach Buenos Aires, start and finish place of the race. By first of all heading south towards the landscapes of Patagonia, the drivers and riders will then have to cross the Andes Mountains before enjoying a rest day at Valparaiso on the shores of the Pacific Ocean. The return trip will then take them to the Atacama Desert and notably to the Argentinean provinces of Catamarca, of Rioja and of Cordoba. The Dakar that has a vocation to discover unknown territories for off-road rally amateurs will cross over the Atlantic Ocean for its 2009 edition. The calendar has therefore been adapted in order to allow the shipping of the vehicles to Argentina’s capital: a first phase of technical and administrative scrutineering will take place on the 26th and 27th of November at Le Havre where the European vehicles will be boarded on ships. The organisers of the rally have announced the opening of the period to send registration files as of the 15th of May. During a month, the competitors that had registered for the 2008 edition of the Dakar will benefit from a priority. Laurent Lazard Racing News Tuesday 13, May, 2008 at 14:32 hs.